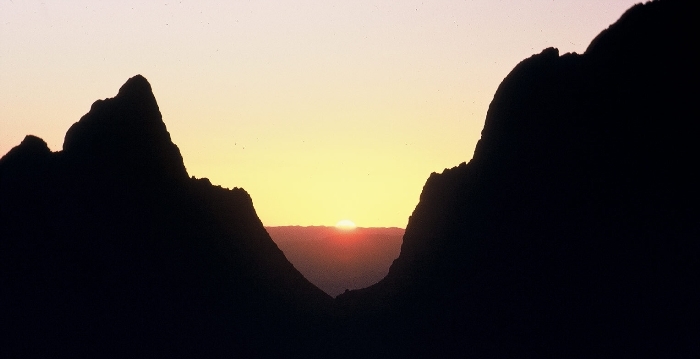 The Big Bend National Park is located in far west Texas about 1000 km from Pearland, but not as far as El Paso. 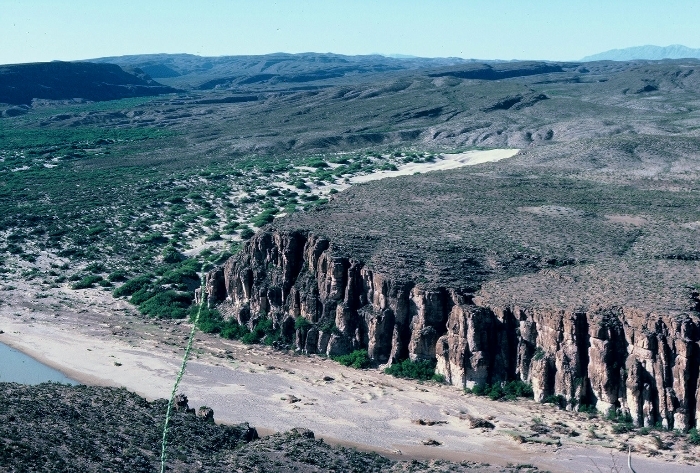 The Rio Grande swings to the southeast after it leaves New Mexico, and at the big bend, swings to the northeast. It eventually turns to the southeast again and enters the Gulf of Mexico near Brownsville. 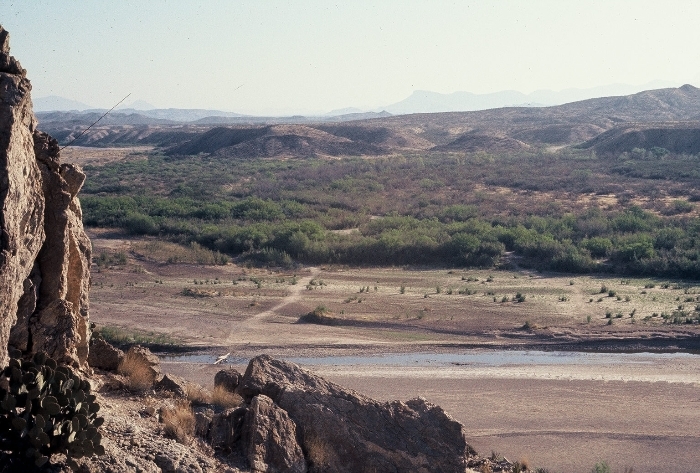 The area is a contrast of high rugged mountains and rolling desert lands. The Park Service maintains several nice camping facilities in the park. Spring and fall are the best times to visit; it is too hot in the summer and snow can make travel difficult in winter. CLICK ON THE THUMBNAIL IMAGE TO SEE A LARGER VERSION. 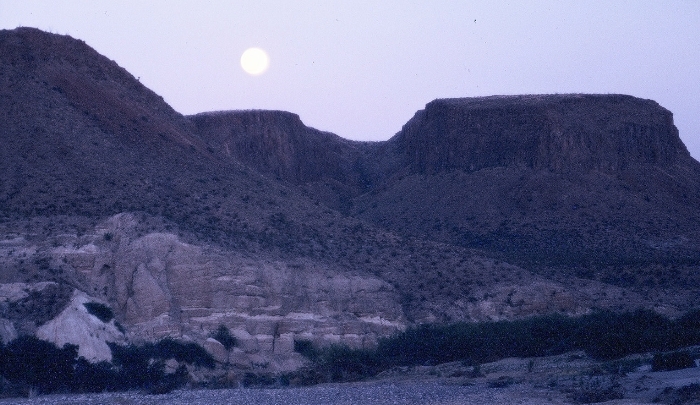 Moonrise from a roadside campsite west of Big Bend National Park. 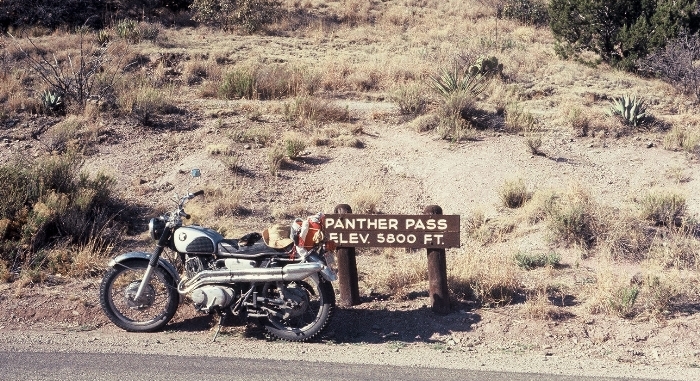 Panther Pass at 5800 feet leads into the 'Basin' of the Chisos Mountains in the bend of Big Bend. View of one campground from 'Boy Scout Hill.' Easy to climb up; scary to climb down. 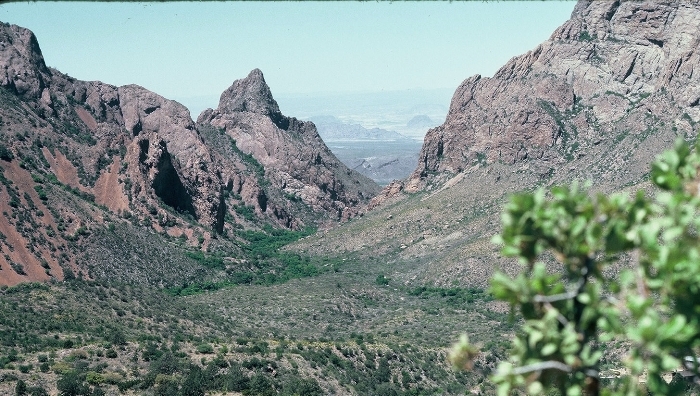 The 'Window' of the Chisos Basin looking west. trail down to the basin. 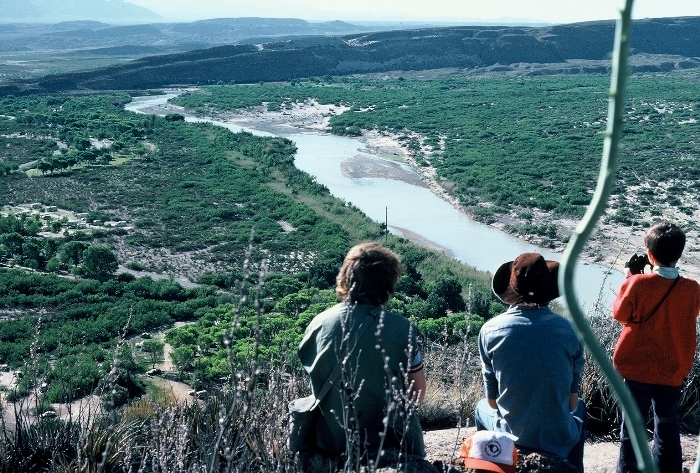 Louis, Jimy, and John looking across the Rio Grande into Mexico. This overlooks the campground at the place where the big bend in the river occurs. A view more to the south.The river exits Mariscal canyon here and flows through a sandy soil area before exiting the park through Boquias Canyon on the east. The small town of Boquillas, Mexico, the residents meet tourists at the river and ferry them across on donkeys are in jeeps. Tourists can have a drink on the other side and give trinkets to the young children. 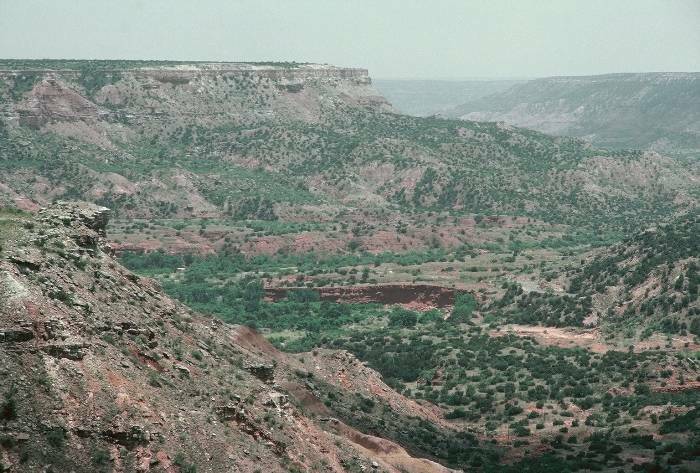 A view of Palo Duro Canyon up in the panhandle of Texas, several hundred miles north of Big Bend. 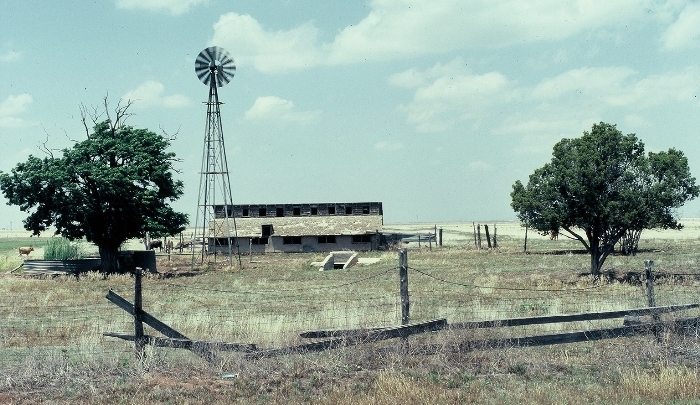 An old windmill near a friend's home in the central Texas plains. 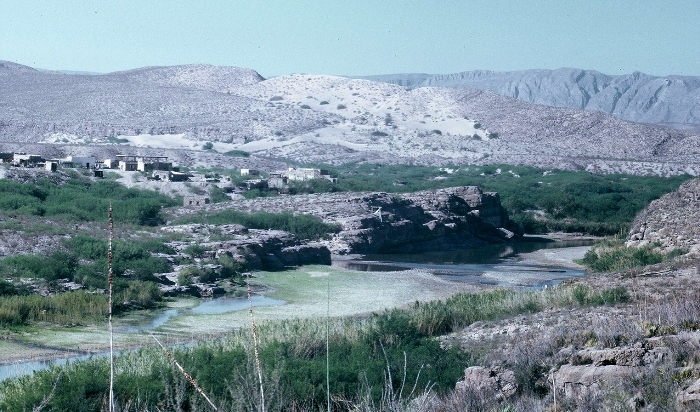 Boquillas Canyon Sand Hill - The Rio Grande River exits the Big Bend National Park through Boquillas Canyon, an impressive canyon cut through the Sierra Del Carmen. 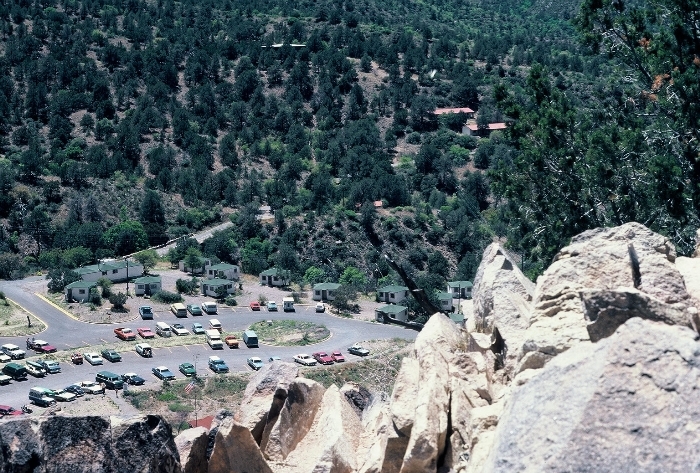 A parking lot is within a mile of the canyon entrance and it is any easy hike for all the family. Just inside the entrance to Boquillas Canyon against the cliff on the north side of the Rio Grande River is an immense pile of sand. The sand appears to have poured from a hole in the cliff about 100 feet up. This page has eleven photos including a photo of the young woman in the bikini. LARGE MAP of BIG BEND This large map may be of interest to you. 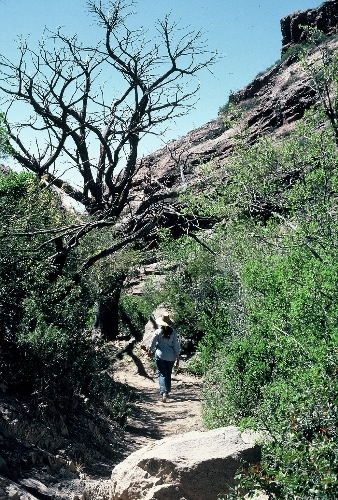 It shows all the features of the park and surrounding areas and includes Big Bend National Park information.